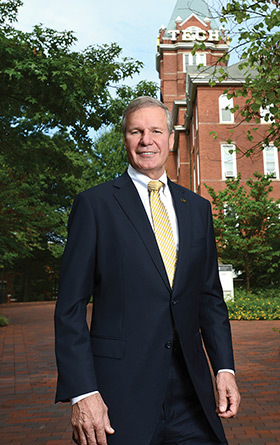 Bud Peterson, who has been at Georgia Tech since 2009, presides over one of the country’s most prestigious technical institutes, engaged in far-reaching research and innovative economic development activities. It has changed dramatically in the last few years, moving well beyond its beginnings as an engineering school. The school’s Technology Square is a magnet for high-tech firms, and Tech has been way ahead of the curve in establishing academic and industry partnerships. Georgia Trend’s Editor-At-Large Susan Percy talked to Peterson in his office on the Tech campus. Following are edited highlights from the interview. Percy: Tell us about Tech. Peterson: Our principal focus is on technology. If it has something to do with technology, then we want to be in that space. I think a lot of folks view Georgia Tech as an engineering school. The reality is about 60 percent of our 24,000 students are in engineering, but we also have a College of Architecture, College of Computing, the Ivan Allen College of Liberal Arts, a College of Sciences. Percy: But you are still an engineering school? Peterson: We are a great engineering school, ranked in the top five. Every single program that we have in engineering is ranked in the top 10 by U.S. News & World Report. There’s not another school in the country that can say that, at least not that I’m aware of. We are at No. 7 [ranked by U.S. News] in the best public universities. In terms of return on investment, we are in the top two or three. But we’re more than that. Percy: What makes you more than that? Peterson: Georgia Tech was the first [public] institute to create a College of Computing [in 1990], putting computing in a separate college by itself, which allows that to really grow and flourish. That was a big step. Another big step was when the College of Sciences moved from being a service college, where they taught science to the engineers. Now it’s an entity in and of itself. They have research programs, some very fine researchers that have allowed that college to flourish and come into its own. Percy: And you have added some other colleges and schools, too? Peterson: The college of management was a department within the Ivan Allen College. It broke off, and now the Scheller College of Business is very highly regarded. We have the Sam Nunn School of International Affairs with a pretty heavy focus on nuclear non-proliferation. We’ve got a school of public policy to try to understand how technology might or does influence public policy. We’ve got a school to offer master’s and Ph.D.s in music technology – not that we’re trying to train concert pianists. We’re looking at how technology influences music. We recently started a new program with Emory to look at technology and the law. Percy: How do you make choices about programs to add? Peterson: We try to look down the road. When I came here a little over six years ago, we started a strategic planning process and spent about a year [preparing] a plan to try to understand what Georgia Tech might be like in 25 years. In 2035, we celebrate our 150th anniversary. What will Georgia Tech look like then, what are the technologies that are going to impact us between now and then? How do we prepare our students to be engaged and involved and knowledgeable about those technologies? Peterson: It’s not like teaching history, where the history doesn’t change – you [just] add a little every year. But in technology, some of the changes are pretty dramatic and hugely impactful. That’s what makes it such a big challenge to work in a field like this at a place like Georgia Tech. Technology is continually evolving. That’s what presents a challenge for us – not just [to] stay current with technology but try to predict and anticipate where the technology is going. Percy: How do you do it? Peterson: It is actually driven by the faculty. They have the expertise and the knowledge to try to anticipate and understand where this is going. If I could go out and hire three or four Isaac Asimovs to try to predict where the science is going in years ahead – those are the kind of people we really are looking for: people who can think about not what’s going to happen next year but what’s going to happen five years or 10 years from now. The biggest challenge that we have is how do we prepare students today for jobs that they are going to have and careers they are going to have in 20 years? Percy: Will your students be ready? Peterson: I often say that the students we are educating today are going to cure cancer, they are going to see interplanetary space travel, they are going to resolve issues around climate change, around clean water, around energy. They are the ones who are going to have to address and solve these problems in ways we can hardly imagine. Peterson: It really is. This is a spectacular place to work. You’re around so many smart people thinking about the future and how to prepare for the future and how to adapt – with a very strong focus on what we think of as grand global challenges. Percy: Tell us about the research going on at Tech. Peterson: Our budget is $1.5 billion a year, and about half of that is funded research. We try to direct research through the people we hire. Percy: What’s the process for developing a new area of research? Peterson: We set aside some new faculty positions and some vacated faculty positions every year to try to look at specific areas that we think are important and will be important. When we hire people, we’re making a 30-year commitment. We want to hire people who are doing things that are going to be important in the next 10 or 20 or 30 years. So it’s through the faculty and the researchers we hire. Peterson: We have a very strong partnership in biomedical engineering with Emory, a growing partnership with Children’s Health-care of Atlanta. Donna Hy-land [Children’s CEO] and I, through the folks that work with us, put together some seed funding grants, and doctors from Children’s and researchers from Georgia Tech come together and submit a proposal on a problem. The physicians have a lot of problems, and we at Georgia Tech have a lot of answers. Percy: So partnerships are important to your research? Peterson: People laugh when I say this, but the solution to any problem is to find somebody who knows the answer. It sounds obvious, but we can manage that through some partnerships. We’ve just established partnerships with the CDC to look at predictive technologies for epidemiology. We established a partnership recently with the dental school at [Augusta University], asking researchers from the two institutions to come together with a joint project. We’ve got a lot of expertise in material science, and a lot of advances in dentistry are related to materials. Also nanotechnology, in terms of stimulating bone growth. Peterson: We are also doing a lot in cell manufacturing. Cell growth and evolution is not just about machines and devices. It’s about stimulating cartilage or removing tumors through growth mechanisms that retard growth in one area. Percy: Can you give us an example? Peterson: There’s a type of deep-seated brain tumor that grows aggressively along neural networks and capillary structures. We’ve got a faculty member who has built nano-scaffolding, using nano materials and scaffolding that provides preferential growth and through electrical stimulation can cause that brain tumor to actually migrate from deep in the brain to the surface where it can be removed. Another faculty member is looking at nano particles of gold that will attach to individual cancer cells. Prostate cancer and breast cancer are terrible diseases: It’s really bad when they [cancers] are surgically removed, but [you] don’t get every single cell. This is a way of getting every single cell. With radiation and chemo we bombard the body to try to kill cells and hope we kill more bad cells than good ones. There’s a lot more science to it than that, but this [new process] allows targeted identification of individual cancer cells. Percy: Any new field that is particularly interesting to you? Peterson: Cyber security – it’s a new field but very strong for Georgia Tech, very rapidly evolving. In the future, a hugely important field. Percy: How do you keep a balance between teaching and research? Peterson: I’ve heard it said that research is to teaching as sin is to confession. If you don’t participate in the first, you don’t have much to do in the second. We try to make sure our faculty are actively engaged in research and moving that research into the classroom. A very large percentage of our students are engaged and involved in undergraduate research. They make very positive contributions. Percy: Let’s talk about economic development. Most university system schools are getting serious about that, but Tech has been a leader. Peterson: Georgia Tech has a long history of partnering with industry. One of the big steps in recent years was when we jumped the [I-75/I-85] connector and went into Tech Square [in Midtown Atlanta]. That provided an opportunity for Georgia Tech to grow and expand and interact with industries in a new and exciting way. What has happened in Tech Square has been just absolutely remarkable. In the past four years, we have had over a dozen companies – Panasonic, AT&T Mobility, Coca-Cola Enterprises, Home Depot, NCR, Ernst & Young, Worldpay US – have all established these innovation centers in or very close to Tech Square so they can access the talent that exists at Georgia Tech in terms of students, faculty, researchers, technologies. I don’t know of anyplace else in the country where that is occurring. Percy: How did this come about? Peterson: What we did very deliberately was to say what are the unique characteristics of Atlanta we can leverage to make Georgia Tech better? One of those is clearly the number of Fortune 100 and Fortune 500 companies, one of the largest concentrations in the country. So how can we partner with those companies to try and leverage what we are doing? What has evolved has been the innovation ecosystem that exists there in Tech Square. It has created an amazingly vibrant and exciting intellectual community that is focused on innovation and has now infected our undergraduate student population. Percy: And you work with startups? Percy: What’s made this so successful? Peterson: There has been a confluence of things. The governor has a strong focus on economic development, and his folks in partnership with the Metro Atlanta Chamber, the mayor and city of Atlanta recognize that job growth is not just going to come from large companies, but from startup new companies. We’re not trying to create Silicon Valley or copy Silicon Valley. We’re trying to create what is the best innovation ecosystem for Atlanta, Georgia and the Southeast, and I think we are making great progress. Percy: You talked about balance earlier. How do you balance economic development with research and teaching? Peterson: We’re a state institution. Georgia Tech was founded to help Georgia move from an agricultural economy to an industrial economy, and what we see happening now is that we are moving from an industrial economy to a knowledge economy. We see it happening in Technology Square. So this is a part of our statewide mission, entirely consistent with research, to prepare and develop technology that leads to new ideas, leads to new products that will lead to new jobs. This is just an extension of the original mission. Percy: What’s your greatest challenge? Peterson: The biggest challenge is how do we prepare students? We are preparing students for jobs that don’t exist to use technologies that haven’t been invented to solve problems we don’t even realize are problems. Percy: Would you talk about the role of athletics at Tech? Surely that has some challenges. Peterson: I often say athletics is the lens through which people view an institution, and that’s true at Georgia Tech. We have a very good balance between athletics and academics. What makes it challenging is that we don’t have a single degree that doesn’t require two semesters of calculus, two laboratory science courses, computer science. We need to recruit student athletes who are strong academically, and we are able to do that. Our six-year graduation rate overall for the student body is 83 percent; for student athletes, it’s 79 percent. In the football program, our average GPA for student athletes is over a 3.0, right at the average for the overall student body. Percy: Do you find the athletic piece difficult? Peterson: I think I’m fortunate to have some experiences that have helped me understand that challenge. I actually went to college on a football scholarship and earned degrees in math and engineering at the same time. There is a balance, and I think we’re in a good place with respect to that balance. It’s a big part of the culture here. Percy: It also makes Tech unique. Peterson: Of the leading technology research institutes in this country – MIT, Cal Tech, Carnegie-Mellon and Georgia Tech – we are the only one of those four that competes in Division I athletics. Percy: How do you view the state of higher education in Georgia? Peterson: Georgia is enormously fortunate. We are one of only a handful of states – maybe four or five – that has two public universities in the top 25 in the country and the only one in the country that has two universities in the top five in terms of return on investment. A lot has to do with the support we get from the state, the legislature and [Board of] Regents. A lot of it has to do with the HOPE Scholarship that has allowed us to retain some of the top talent in the state of Georgia. Our target [at Georgia Tech] is that we have at least 60 percent of our student body from Georgia. Half of our graduates stay in the state after graduation.